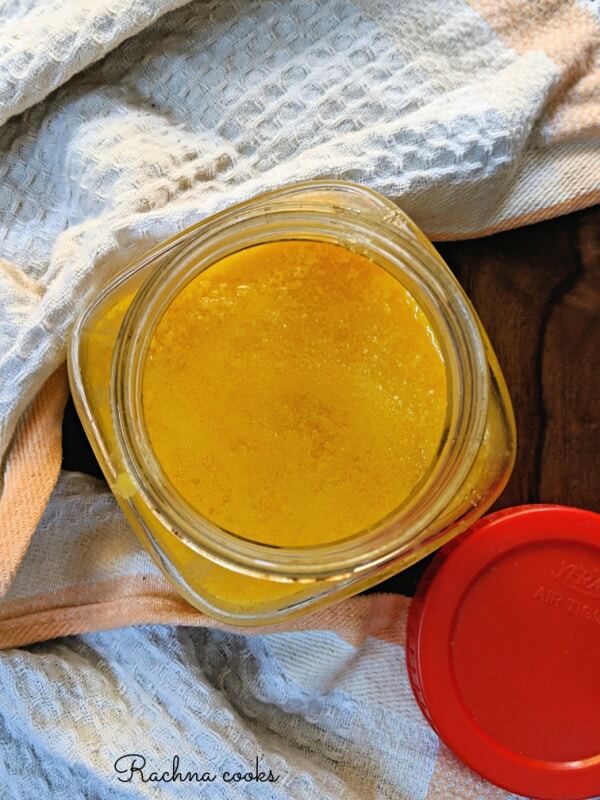 Homemade ghee or Clarified butter is very easy to make. 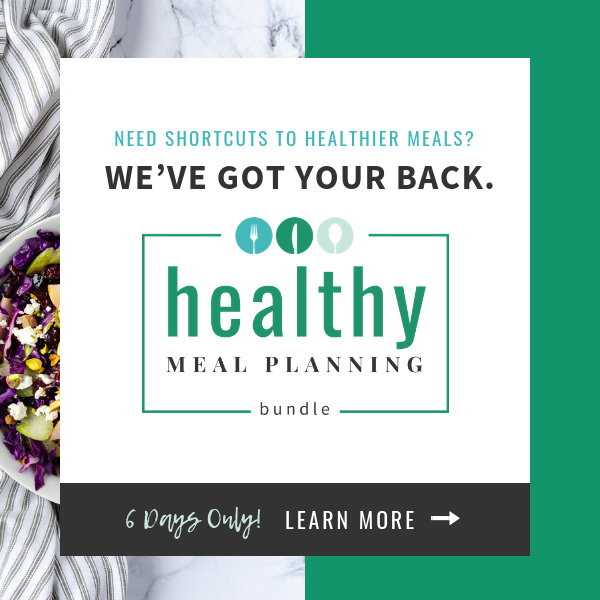 But you do need to include a few steps in your routine. The first thing is to start getting whole cow’s milk. If you boil it and keep it in the fridge overnight, you will get a thick milk cream or malai in the morning. Just strain this and store in a container for a week to make homemade butter and then clarified butter from it. Desi ghee is made from cow’s milk. You can make it from buffalo milk as well. What are the benefits of homemade ghee? Clarified butter has fat-soluble vitamins that help in weight loss. Ghee is known to maintain hormone balance and maintain healthy weight. Ghee contains omega-3 fatty acids and Vitamin A which are good for our health. Using ghee in winter helps keep the body warm. It is good for skin, intestinal health, helps in preventing constipation, relieves clogged nose. This is a step-by-step recipe of how you can make homemade ghee at home from milk cream. 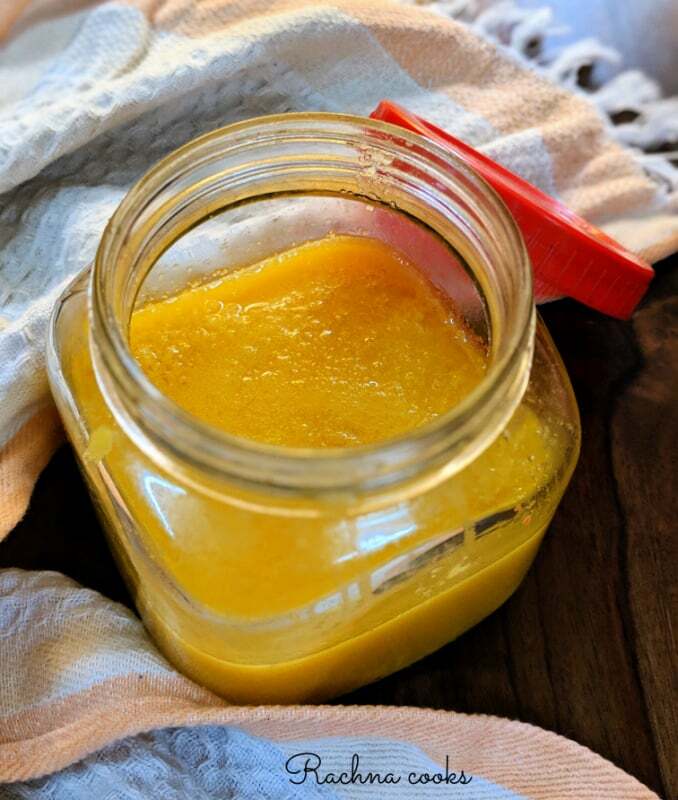 Homemade ghee is not only tasty but has many health benefits. 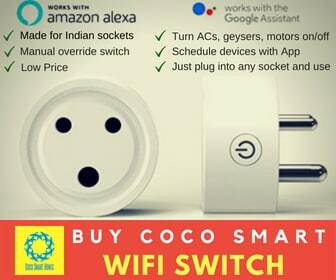 Do try this easy recipe. Take whole fat milk and boil it. Let it cool and leave it in the fridge overnight. Collect milk cream in the morning in a container. 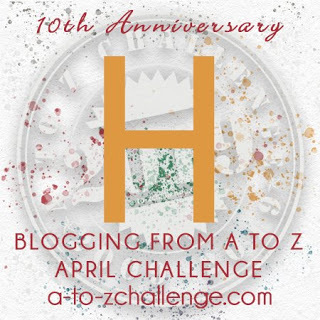 Do this for 7-10 days till you have a cup of thick cream. Add 3-4 tbsp. of yoghurt or curd to this cream and mix well. Leave it overnight to form curd. Once the curd is ready, you can churn it with a traditional churner, by hand, in a blender or a hand mixie. I used a hand blender. It took me about 10 minutes for butter to separate from the whey. This whey or buttermilk is delicious. You can add a few spices and consume it. It is healthy as well. Now wash this butter with water multiple times till the water runs clear. Your homemade butter is ready. 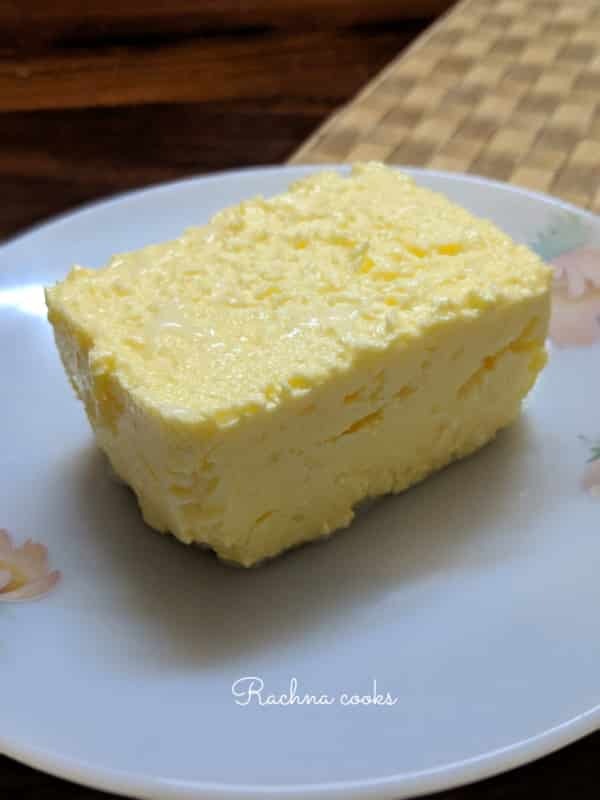 You can use this fresh butter for your food or can heat it further to make ghee. Take an iron or copper pan and heat it. Now pour the butter in it. Heat it on low heat for about 10 minutes. You will see that the clarified butter or ghee will separate from the milk solids which settle down in the pan. Once the milk solids have turned golden brown and completely separated from the ghee, turn off the flame and let it cool down. Once cold, strain the ghee into a sterilized glass bottle. Your homemade ghee is ready to use. Your ghee has a pale yellow colour and a very pleasant smell and taste. It has a granular semi-solid texture at room temperature and will solidify in winter. You can consume the milk solids left behind or add it to sweets. I sometimes eat it with a little sugar. You can store the homemade ghee in a glass bottle and it will not spoil. If you are using homemade butter, store it in the fridge. You can store milk cream for more than 7-10 days by storing in the freezer. Then you can make a larger monthly batch. If milk cream is stored for more time in the fridge, it may start smelling sour hence it is better to make ghee from it every 7-10 days unless you are freezing it. Sieve thick milk cream from boiled and chilled whole milk daily for 7-10 days. Then add 3-4 tbsp. 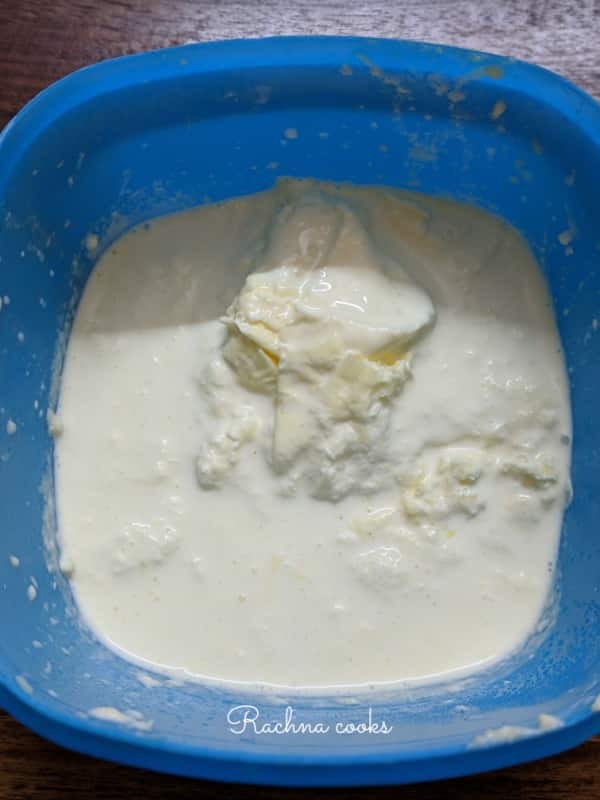 of curd and let it set overnight to form curd. Now whisk this curd for 10-15 minutes in a blender or with a whisk. Butter will separate from whey or buttermilk. 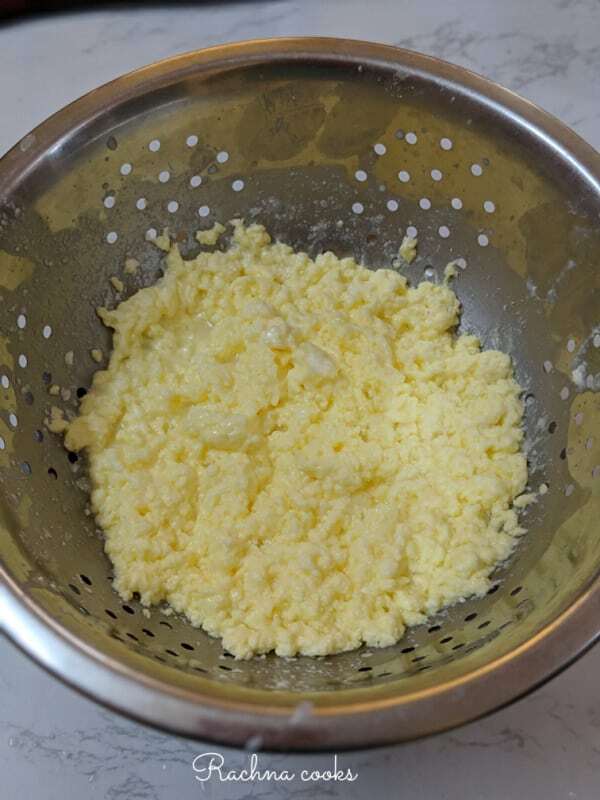 Sieve the butter and wash it multiple times with cold water till water runs clear. Your homemade butter is made. You can use it as is but remember to store it in fridge. Or you can heat it to make ghee or clarified butter. Heat this butter in a pan for 10 minutes on low flame till clarified butter separates out and milk solids settle down. Sieve it and your desi ghee or clarified butter is ready to use. Pour into a glass bottle and use. Hope you liked how to make homemade ghee or clarified butter and will give it a try. Do also watch this video to help you see the process and get an understanding of how to make ghee. If you liked the recipe, I request you to give a * star rating either on the recipe or when you comment. Thank you. Do try. 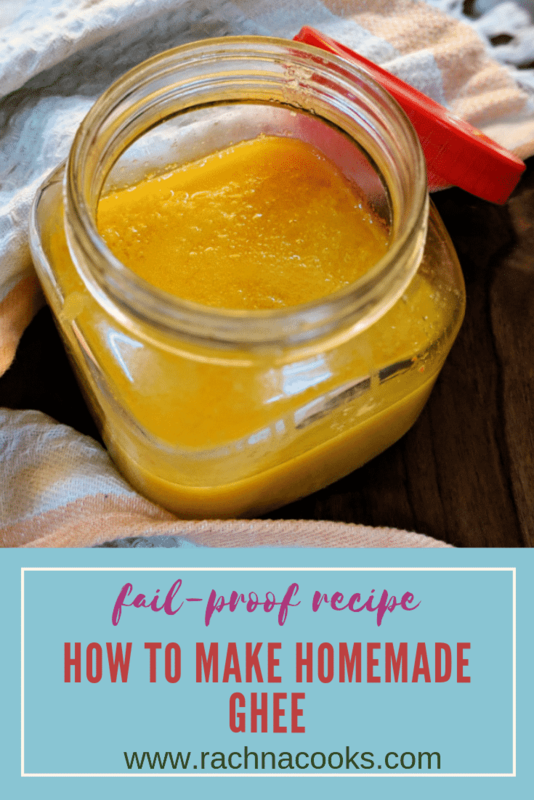 Homemade ghee has a special taste. My mom used to make it at home and sell it in the neighbourhood too! The taste of homemade ghee and butter is so much better than the readymade ones. Had to give away the half processed malai to my maid. Now I need to get a new hand mixer! Sighhhh! I have never washed butter with water. This is something new for me. Why do we need to wash it with water?? Will try it next time. Love the color of your butter and ghee!! We wash it with cold water so that the butter firms up further and also to remove all traces of milk solids from it. I have made ghee and butter at home from stored malai (milk fat). I learned this process from my Nani (my grandmother). The taste is just awesome. She always prepared fresh ghee for me whenever I left for my hostel. We smeared fresh butter on aloo paratha – it tasted heavenly! I love ghee and butter in my every meal. Yes our grandparents definitely made their ghee at home. Good to have you here, Kislaya. Also lovely pictures and thanks for explaining the process in the video as well!! It looks yum. Glad to know that the post helped you out, Debbie.